(IO/IAA) (Jakarta) 2002 - 2003. Photos. Framable Color Prints and Posters. Digital Sharp Images. Aviation Gifts. Slide Shows. 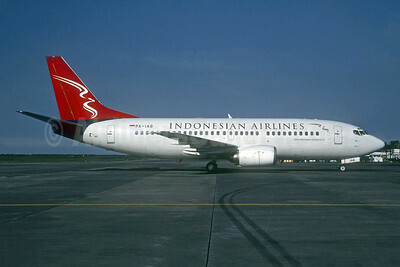 Indonesian Airlines Boeing 737-330 PK-IAB (msn 23527) SUB (Christopher Witt -Christian Volpati Collection). Image: 945654.